About this time last year, we at On Spec received the disturbing news that our application for funding from the Canada Council for the Arts during 2015 had been rejected. It was rather stunning, especially accompanied by jury comments about how poor our fiction selections were, and how sloppy the magazine’s production quality had apparently become, in the jury’s opinion. There is no appeal process, so we did what we could do under the circumstances: severely reduced our production and organizational and staffing costs; depended even more on our volunteers; and tried to increase fundraising efforts with our Patreon campaign. We have managed our dwindling resources very cautiously, and we are grateful to our other granting agencies, the Edmonton Arts Council and the Alberta Media Fund, for their support. A few weeks ago, we received the news that once again, the Canada Council jury had deemed On Spec unworthy of support in 2016. To add insult to injury, instead of a few vague criticisms, we were provided with a scoresheet, showing our high, low and median scores from this year’s jury, based on the criteria they used for judging. Magazines are judged on: quality of writing, design, marketing and production; ability to identify a target audience and reach readers; quality of the magazine’s administrative and financial management; excellence of content and quality of writing and editorial work; achievement of mandate and editorial vision; and contribution to the development of the practice. While we certainly cannot argue that we should pay writers more, being told that we don’t demonstrate an ability to identify our target audience, or that we lack a strong editorial mandate, clearly shows that the jury pretty much ignored or discounted everything we had carefully explained in our application, along with the testimonials we provided on the quality of our fiction and our value to the development of the genre in Canadian writing. Once again, there’s no appealing the decision. Some hard choices had to be made, and the first is that, starting with our Spring 2015 issue (delayed due to several family emergencies among the members of our senior editorial staff), On Spec will temporarily suspend print production, and be available as a digital magazine only. We trust that, as soon as funds become available, On Spec will be printed for our subscribers, and we appreciate their support. As soon as the issue is available, our subscribers will be informed by email or by letter, and given a means to freely access the digital issue in their preferred format. In times to come, our marketing and fundraising efforts will increase to the best of our abilities, and we look forward to publishing more excellent fiction and poetry for many years to come. We are also proud to announce the launch this month, of Sleuth Magazine, a new Canadian digital journal of mystery and suspense. 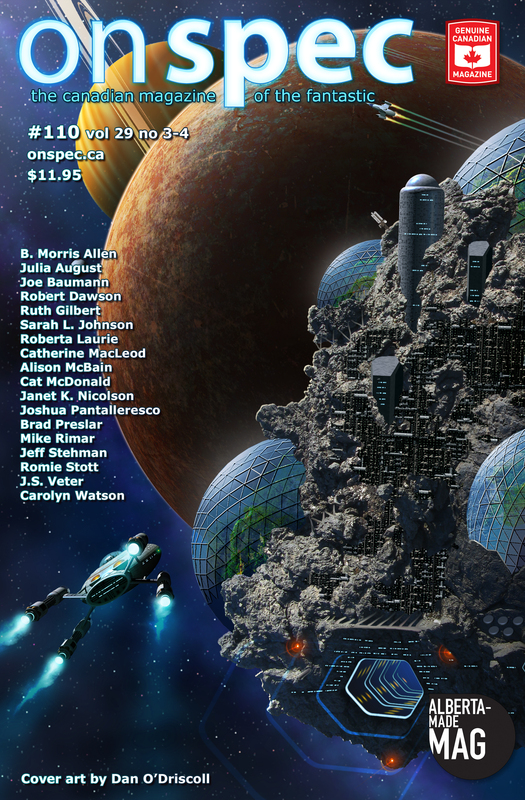 The first issue will be presented at When Words Collide in Calgary. We hope that Sleuth will fill a niche in much the same way On Spec did, 25 years ago. Thanks, as always, to all our contributors, subscribers, and donors for their ongoing support. I am saddened by this news. Having re-discovered On Spec I was looking forward to fresh Canadian content. I am eager to read Sleuth is there a way to pre-order? Well, you’ll be glad to know On Spec isn’t going away. We just aren’t going to be printing hard copies. As for Sleuth, you can check them out here. Thanks! So, the launch is this weekend?